Today marks 311 years since Antoine Cadillac, after six weeks’ voyage from Montreal, shored his canoe and founded Detroit for France. To celebrate, here’s an excerpt from my book, Hidden History of Detroit, which includes a chapter on Cadillac, the self-styled Marquis du ville de Troit. Bon anniversaire, you strange and wonderful city. It is in this land, so fertile, that the ambitious vine, which has never wept under the knife of the vine-dresser, builds a thick roof with its large leaves and heavy clusters, weighing down the top of the tree which receives it, and often stifling it with its embrace. Under these broad walks one sees assembled by hundreds the timid deer and faun, also the squirrel bounding in his eagerness to collect the apples and plums with which the earth is covered. Here the cautious turkey calls her numerous brood to gather the grapes, and here also their mates come to fill their large and gluttonous crops. Golden pheasants, the quail, the partridge, woodcock and numerous doves swarm in the woods and cover the country, which is dotted and broken with thickets and high forests of full-grown trees, forming a charming perspective, which sweetens the sad lonesomeness of the solitude. The hand of the pitiless reaper has never mown the luxurious grass upon which fatten woolly buffaloes, of magnificent size and proportion. The men – some of them soldiers in uniforms with brass buttons that blink in the sun; some of them Canadian privateers, who’ve been singing, swearing and chain-smoking for the past six weeks – select a bluff on the north face of the river, shore the boats, and strike camp. Cadillac claims La ville de troit – city on the straits – for the glory of God and King Louis XIV. It’s a beautiful frontier yarn: brave, rugged, holy. As the trees begin to fall under the axes of the voyageurs, a sweeping tale of settlement, struggle, progress, politics, industry and identity begins. Before the brash wind of Chicago began to blow; before the steamship settled the canal towns of Pittsburgh and Buffalo; before Moses Cleaveland established Cleveland; even before this same French empire founded New Orleans, the continent had Detroit. Just as easily, we could begin this tale in the Court of Versailles, where Cadillac travelled in 1698 to present his proposal for a French colony at Detroit. 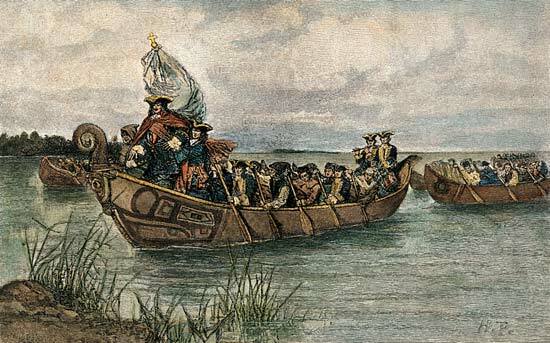 Of course, the Company of the Colonies already had a trading post at Michilimakinac, which Cadillac commanded, but our reliably grand protagonist envisioned something bigger: a permanent establishment, with permanent settlers, a perfectly civil French society living in harmony with, and improving the lives of, the local Indian tribes. The idea was radical, and it had its detractors – Cadillac never lacked detractors – but the opportunity to thwart English designs on the region and control a major byway of the economically crucial fur trade won over the chamber. A 1902 painting by Fernand LeQuesne commemorates the dramatic moment when the King grants Cadillac the deed to the colony, and 15 acres therein to call his own. Cadillac bows, the King stands in his sun-like splendor and curly wig and pretty buckle shoes, and the Court of Versailles just ricochets with manifest destiny and fatal extravagance. But to really start wrestling with the Cadillac mystique, perhaps we begin this story in the rural town of St. Nicholas de la Grave, Gascony, where Antoine de la Mothe was born on March 5, 1658. His middle-class parents did not grant him the regal title Sieur de Cadillac, so inextricable from Detroit’s history, so gracefully evocative of American automotive style: Antoine invented it for himself. We don’t know much about his early life, except that he left for Canada in 1683, possibly under durress. His career began in Nova Scotia, where he took up with the privateer Francois Guion, learned the lay of the coastal lands, fell in love with the boss’s niece, Marie-Therese, married her in Quebec, and returned, somehow, to a 25-mile land grant on the island of Mont Desert. The rest of his time in Acadia was apparently spent arguing with the governor. This became a motif of Cadillac’s career. During what we’ll call the abridged years, the English burned down the town where Cadillac lived. Cadillac lost his house and everything else and returned for Quebec. I am not sure what happened to his land holdings, but I do know that Mont Desert, the highest point on the North Atlantic seaboard – and, in the winter, the first place in the United States to see the sun rise – is named Cadillac Mountain. Governor Meneval couldn’t say a single nice word about him, but the French empire saw something in the fiesty upstart and sent him to Michilimakinac to take over as commandant in 1694. Though under his tenure the diplomatic affairs of the post were “extremely confused,” he made a pretty penny in the fur trade, and as he accumulated wealth, his status as an influential asset to French power remained secure. Just a few years later, the King declared the French fur markets saturated and withdrew all licenses from existing trading posts. The King invited Cadillac to stay. Cadillac didn’t want to. He was a fortune-maker, not a military middle manager. He left for France. Maybe on the long sail, he hatched his master plan. And this is where the story comes back to where we started it: the Court of Versailles, the parade of canoes, the axes, the high, verdant bluff of the newest holding of New France. Cadillac got his city on the straits. It was the most triumphant moment of his career. Glad to find your blog! I love that you write about Detroit! I’ve got a few posts about Detroit as well. I’m gone to tell my little brother, that he should also visit this blog on regular basis to obtain updated from latest news update. Amy Elliott Bragg, I invite you to read the articles on the Early Detroit page of the French-Canadian Heritage Society of Michigan. All of them are thoroughly researched in primary documents. Other pages on the site have articles and images related to the people and events at Fort Pontchartrain as well as the larger history of Detroit and of Nouvelle France / New France. You might also include our website in your list of resources. See our meeting page for upcoming gatherings this fall. Th artist certainly had a great imagination, I doubt that Cadillac went all the way to Oregon or British Columbia to get a Northwest Coast boat and hulled (or sailed it around South America – no Panama Canal then) it back to Detroit to land on the shores.